The all-Ireland Irish language body Foras na Gaeilge has advertised the contract to publish a weekly newspaper after two previous papers closed. In June the Galway-based Foinse closed after it was unable to agree a new contract with Foras na Gaeilge. In December last year Northern Ireland's only daily Irish language paper La Nua closed. Foras Na Gaelige are inviting tenders for a weekly paper which they will fund from November 2009 to October 2013. The closing date for applications is September. 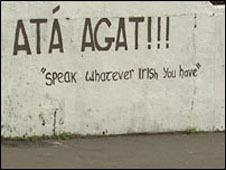 In June Mairtin O'Muilleoir, former publisher of La Nua, claimed Foinse suffered from a lack of support Foras na Gaeilge. He said: "For Foras na Gaeilge to lose one newspaper in La Nua is a tragedy but to lose two with Foinse closing is just plain carelessness."